We would have called it Co-oplunky, but that's just us. Old-style Spelunky plus online co-op sounds like a grand idea! A modder by the name of Vadim has been toying with Spelunky Classic's source code for a few months, backporting features from its bigger, brighter brother Spelunky HD. The best feature is actually new to the series: online-enabled co-op play for two players, all for the nice price of free! Spelunky Classic's source code was released to the public at the tail end of 2009. Community modders have created alternate versions and additions to the game ever since, pumping out things as simple as swapping the spelunker sprite for the damsel sprite or as complex as complete overhauls to make Spelunky look and act like a Metroid game. 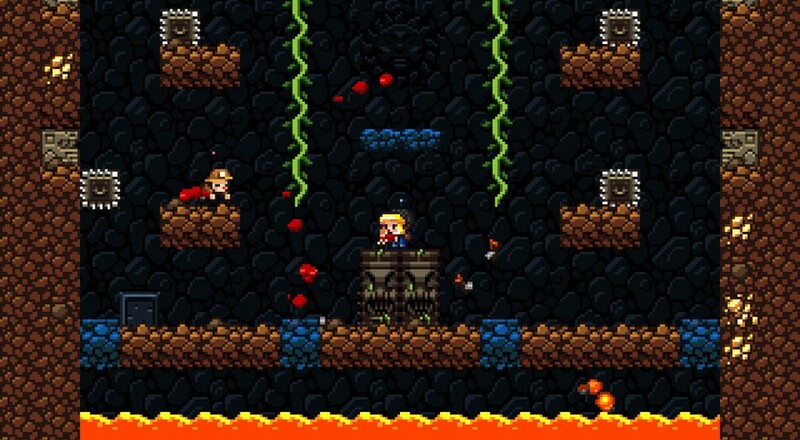 This Spelunky SD mod doesn't go out on any limbs. The biggest feature is something Spelunky HD itself lacks: online co-op. The original Spelunky was single player only, while its HD remake allowed for two player local games. Vadim noted this isn't the first time someone has tried to add online multiplayer to Spelunky. Those attempts failed largely because the game was built with support for only one instance of the player. Adding a second character meant everything in the game ignored them, sort of like playing your teenage self in high school. A full account of the network problems and discovered solutions can be found on the announcement post. The Spelunky SD is available to download for free as a single package from GameJolt.